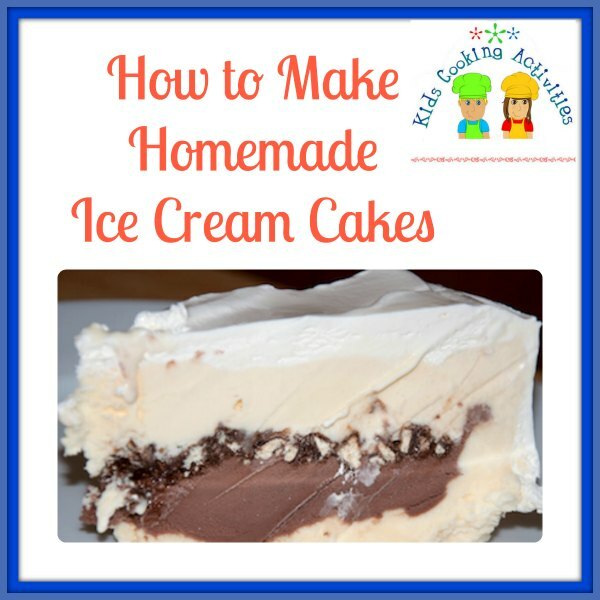 By using a ball cake pan, making a homemade ice cream cake turns out really easy and one of our favorites! We also have directions for a purely layered ice cream cake like you'd buy at an ice cream store, love it! This tutorial was made using the Betty Crocker bake and fill pan. We'll tell you below how to use a ball cake pan instead for an ice cream dessert. Fill your ball pan to the fill line and the circle pan with batter. Add insert to your ball pan. Bake and allow to cool. Take out insert. Now comes the fun part where you fill your ball with ice cream. Allow your ice cream to soften slightly and fill hole. Top with round circle. 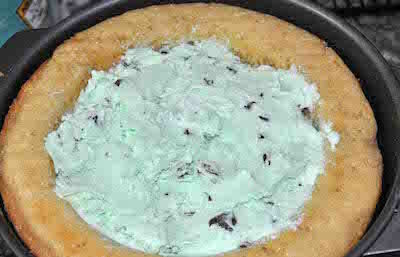 Flip over on serving platter and frost with a crumb coat and decorate. Make sure when decorating your ice cream cake, you work fast and place it back in the freezer if it is getting too soft. You don't want the ice cream to melt into your cake. Also store in the freezer until ready to serve. 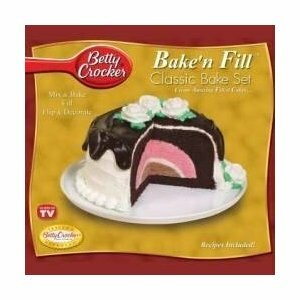 This cake was made with the Bake and Fill dome shaped pan that comes in the set. Don't have a Bake and Fill pan? Bake a 9 inch pan and a ball pan for this recipe. Allow to cool. Carve out a hole on the bottom of your ball cake making sure to leave several inches thick around the sides and top of ball to keep your cake sturdy. It will look much like the picture above. Fill your carved out ball with ice cream and top with the 9 inch pan. Flip over onto a serving platter and decorate. 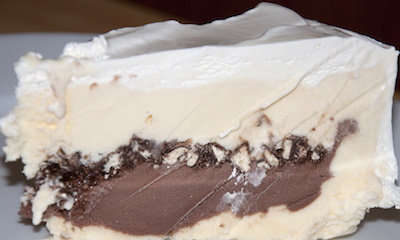 This is my favorite way to make ice cream cakes. You can try different varieties of ice cream as you'd like. 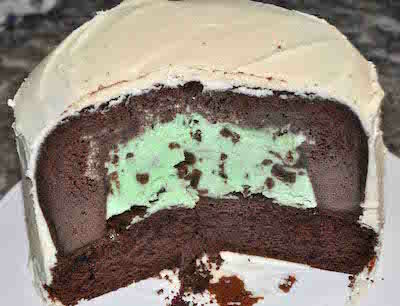 Our favorite is chocolate ice cream with mint ice cream inside. Freeze a 9 inch springform pan and allow vanilla ice cream to soften. When soft layer vanilla ice cream on bottom of pan and up the sides. Freeze. 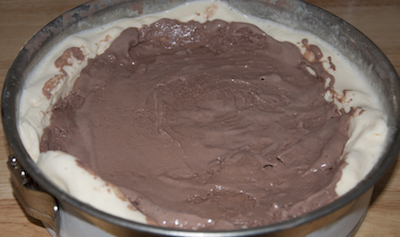 Unthaw chocolate ice cream and smooth over vanilla ice cream. Freeze again. Crush chocolate cookies or candies and stir in 1-2 Tablespoons chocolate syrup. Sprinkle on top of chocolate ice cream. 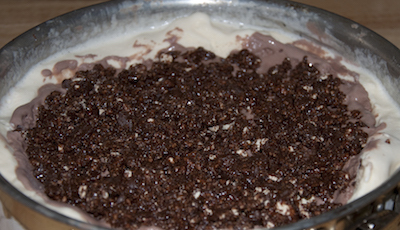 Unthaw vanilla ice cream and spread over chocolate cookie layer. Smooth ice cream to edges. Refreeze. 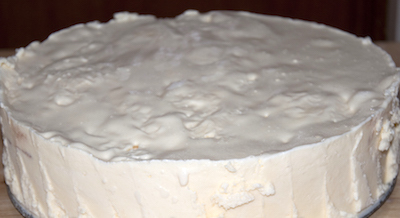 Take cake out of freezer and use a knife run under hot water along edges. Open springform pan and refreeze. 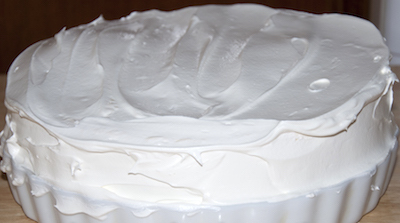 Spread cool whip all over top and sides of cake. Refreeze until ready to serve.